With an update to its app, ESPN is making it much easier to live-stream sports. The sports network empire is incorporating WatchESPN — its live-streaming product that cable and satellite providers support — into its main app, effective Thursday. The idea is that users can read about a game in progress and then start watching it with just a click. 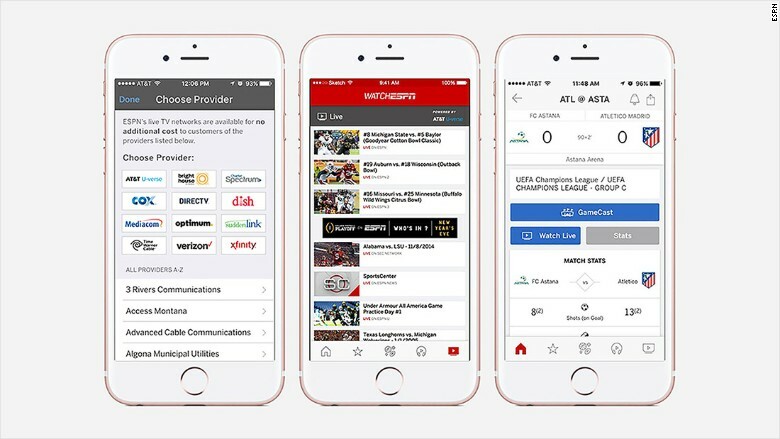 Senior vice president for product management Ryan Spoon said the integration "puts live streaming in front of triple the audience," because the main ESPN app is so much more popular than the separate WatchESPN app. Down the road this could also make it easier for ESPN to sell its networks directly to consumers, bypassing the cable and satellite companies. But for now that's not the strategy. The live-streaming service already sets a new record practically every week. Once users put in their cable username and password, they can live-stream nine of ESPN's networks plus special ones like Goal Line (the college football equivalent of RedZone). "People are getting comfortable" with streaming, Justin Connolly, ESPN's head of distribution, said in a telephone interview. He can see it happening on a week by week basis as more users live-stream college football games, NBA games, the US Open, and other sporting events. Conventional wisdom says that live sports are best viewed on the biggest screen possible. While that remains true to a large degree, the streaming side is growing rapidly. What stands out is the regularity of the behavior. While the network won't share specific data, it says September was WatchESPN's most-viewed non-World Cup month ever. October was #2. "We're seeing this become a regular week-in, week-out activity," Connolly said, particularly when it comes to college football on Saturdays. He said ESPN has also been impressed by "the large additive audiences" for "Monday Night Football." While the games "still command a very large audience on TV," viewers who maybe couldn't watch before — because they weren't near a TV set with a cable hookup — are increasingly watching via phones and tablets. The WatchESPN app is available on streaming boxes like Apple TV, so that's also contributing to the increasing viewership totals. For ESPN, the top 10 most-streamed regular-season college football games have all taken place this season. The same is true for the top 10 most-streamed "Monday Night Football" match-ups. While ESPN faces numerous challenges — a shrinking base of cable and satellite subscribers — it is arguably making its product more appealing and accessible to its core audience. Authentication, meaning the process of logging in with a username and password, remains a headache for both users and networks. ESPN executives say they're making progress. "Making it easier, making it more seamless, is something we're focused on," Connolly said. "The fewer barriers there are to someone getting the content, the more usage we'll see, beyond what we've seen thus far." Spoon said the incorporation of live-streaming into the flagship network app is about having a more "singular" app experience. "Over the recent months we have introduced enhanced audio capabilities with live radio streaming and podcasts and this week, WatchESPN. And like the rest of the app: this is step one," he said.